Would You Be Able to Recognize Oral Cancer Symptoms? Oral cancer is deadly and it’s on the rise! Smoking and drinking alcohol can put you at high risk for developing this cancer, but there are many who are not a part of this “high risk” group who have also been affected by it. 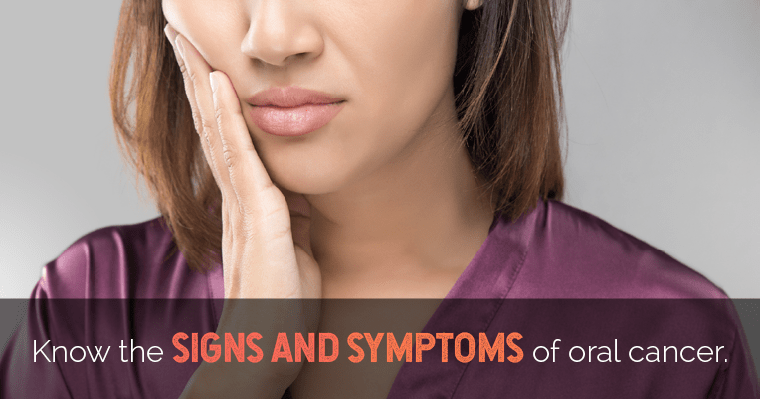 Would you know how to recognize oral cancer symptoms? Why is early detection important? Our blog post will give you the vital information you need to protect yourself and your loved ones. According to AAOMS (American Association of Oral and Maxillofacial Surgeons), oral cancer kills nearly one person every hour of every day of the year! And the reason why the death rate for this kind of cancer remains particularly high is that it is routinely discovered late in its development. Being able to recognize oral cancer in its earliest stages lessens the severity of needed treatment and the negative long-term effects. There are different oral cancer symptoms to be aware of for early-stage and late-stage development. So, what are the symptoms you should be watching for? One of the good things about oral cancer is that it frequently begins with easily identifiable symptoms. But many people either ignore the symptoms or do not seek the help of a medical professional until it has advanced to a more serious stage. 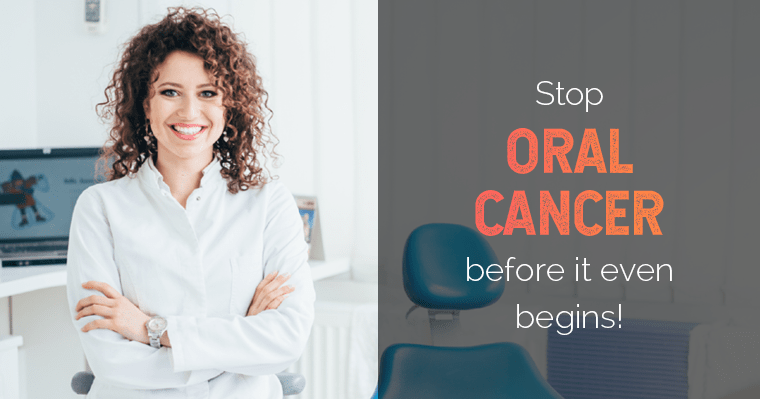 You can be proactive in your fight against oral cancer by taking five minutes a month to check your gums, tongue, and lips for any of these tell-tale signs. The Oral Cancer Foundation has set up a specially dedicated website, www.checkyourmouth.org, that has a simple how-to video and step-by-step written guide on self-screening for oral cancer. Because many people simply do not routinely self-screen for oral cancer, dentists have become the first line of defense when it comes to detecting it. Many dentists either include or offer oral cancer screening as part of a routine patient examination. If you have not had an oral cancer screening from your dentist lately, ask for one. Many dental professionals will be offering free oral cancer screenings during the month of April as part of their efforts to support oral cancer awareness week. What will happen during your oral cancer screening with your dentist? Your dentist will ask you about any changes or symptoms you’ve noticed. There will be an examination of your gums, lips, cheek lining, and tongue. Your throat, soft palate at the back of the mouth and the back part of the tongue will be looked at. Finally, your dentist will feel your jaw and neck for any lumps or abnormal thickening. Sandy explains in this video from the American Dental Association how an oral cancer screening from her dentist saved her life. Be aware! Take action! Stay healthy! You do not need to be a victim. Following the suggestions in our blog for self-examination and partnering with your dentist in prevention can keep you from being another unhappy oral cancer statistic this year. Book your oral cancer screening appointment today!